When it comes to free alternatives to TV subscription services there is now a new option that just keeps giving. The Humax HB-1100S is the company’s latest set-top box that offers Freesat for over 200 free TV and radio channels. This new box adds Wi-Fi into a compact form that’s designed to enhance your home. Despite the size this little beauty packs in a TV guide that lets you scroll through channels back for up to seven days and includes 14 HD channels. So rather than going in and out of apps like BBC iPlayer, you can see all the catch-up shows right there in the guide. The built-in Wi-Fi allows for catch-up TV shows to be streamed seamlessly via your internet connection while live TV comes via a satellite dish. 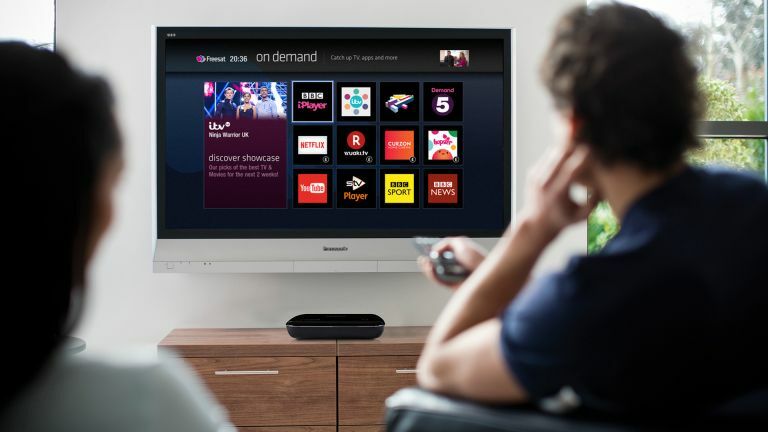 The Humax box also offers third-party apps like Netflix, YouTube, Curzon and more. Since these all work wirelessly they’re ideal for use on a second TV in another room, for example. The Humax HB-1100S also works with its own app meaning you can browse shows and plan viewing on the move or use the app as a remote when at home. Gadgets like phones and tablets can also be used to stream videos, music, pics and more via the box onto a connect TV. The Humax HB-1100S is out mid-April for £99. Is this our first whiff of what Sonos has planned for its Beam 2?